Undoubtedly one of the most important apple varieties of the 20th century, both as a commercial variety in its own right, and as breeding stock for many other varieties. Very good flavor when home-grown. Golden Delicious apples are firm, crisp, and white-fleshed. These apples have a balanced sweet-tart aromatic flavour, which has been described as honeyed. The flavour varies depending on where these apples are grown; in a cool climate, the number of acid increases, actually creating a sweeter flavour. When grown in warmer areas, the acid content is lower, creating a milder flavour. 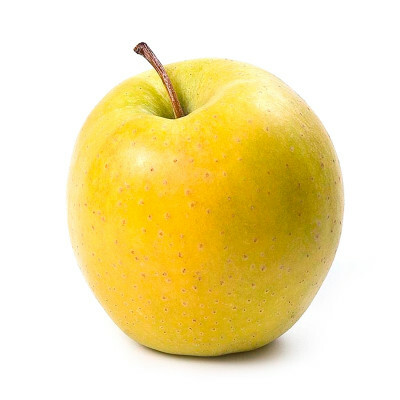 The sweet-tartness of the Golden Delicious means this apple is a good fresh eating variety. Fresh, raw apple slices may be added to green salads, fruit salads, or grain salads. Golden Delicious apples also have the necessary acid content and stability for baking. They can be baked into crisps, crumbles, tarts, cakes, galettes, and breads. Apple slices may also be cooked down into preserves and kinds of butter, or pureed into sauces and soups.